Eugene Systema offers group classes, seminars, and tailored private training for self defense, health and fitness. 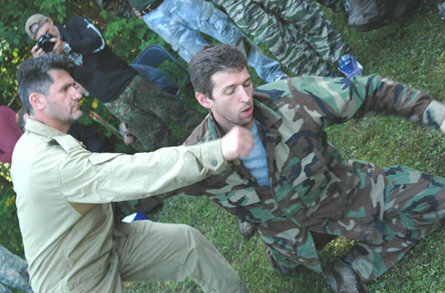 Systema develops ability through an exploration of breathing, relaxation, body position and movement. Self defense, tension management, sensitivity and awareness, overall mobility and spontaneity are all potential benefits of this training. Systema is designed to enhance your health and survival in everyday life and in any dangerous or stressful situations that may arise. Through training, you will find yourself thinking and moving more freely, letting go of unnecessary fears, approaching your work more effectively, and gaining confidence in all areas of your life. Matt Lowes is a certified Systema Instructor under Vladimir Vasiliev. He has over 25 years of experience in martial arts. Matt also trains in Aikido and has a blackbelt in that art. He is a licensed school teacher in the state of Oregon, an education professional with extensive experience working with students from diverse ages and backgrounds. Matt has been training in Systema since 2005. His primary instructors were Kaizen Taki and Brian King of Systema Northwest and I-90 Systema in Seattle, both Certified Instructors under two of the world’s most prominent Systema masters – Mikhail Ryabko and Vladimir Vasiliev. Matt has had the privilege to receive direct instruction from many of the top Systema instructors in the world, including Vladimir Vasiliev and Konstantin Komarov. Matt has been offering classes in Systema at BMAI since 2009. Matt began his martial arts training in Aikido in 1990 and has extensive practice in a wide variety of Aikido styles. Before moving to Eugene in 2004, he studied under Bob Felt of the University of Wisconsin Aikido Club (under Akira Tohei Shihan in the United States Aikido Federation); John Stone (6th dan) and Robin Cooper (6th dan) of Aikido of Madison; and Leslie Libbie (4th dan) of Chisai Aikikai (under Mitsugi Saotome Shihan in the Aikido Schools of Ueshiba).